Shipman Industrial Bolt and Pipe Cleaner patented brush cleaning system, the portable bolt and pipe cleaner is capable of cleaning bolts and pipes from ¾-in. to 3-in. in diameter. This 475-lb unit features a 1.5 hp, 110 v General Electric motor and variable speed servo drive that allow the machine to clean bolts and pipes quickly. The brush cleaning system offers a large surface area contact to provide a clean product that is ready for re-coating or re-installation. The brush system is covered with a shielded housing that automatically shuts down the cleaner when the cover is raised during operation. The cleaner traps the airborne particles produced during the cleaning process and collects them in a small, on-board vacuum cleaner that is designed to be easily discarded. The machine can also be connected to a central shop vacuum. Built on steel frames with rolling coasters, it can be moved around for multiple site work and can be transported in the back of a maintenance vehicle. 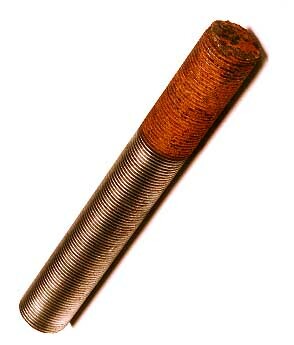 The system can be used in power plants and can be used for routine in-plant bolt and pipe cleaning applications.